Super Sonico is a college girl with a very busy schedule, but today she wakes up late and without notice she is about to miss her first class of the day. Quickly, Sonico rushes and grabs her bike, in her road to college several neighbors recognize her and praise her for been so responsible. Sonico is not just a gorgeous girl, she is a good student, works as a model, helps her grandmother at her bar and also is part of a music band. Once at school, Sonico is as usual, and participates in every class, her teachers love her attitude, but are a bit worried that she is a bit late every day. As the day goes by, Sonico and her friends leave college, one suggests they should go have a bite somewhere, but Sonico has job to do. Once again, Sonico rushes and finds the address where she is supposed to have a photo session for a client. Her manager, Mr. Kitamura has not arrived, but the client is in a hurry and asks if they can begin right away. Sonico puts on a bikini and they begin to shoot, the client is astonished because of Sonico’s presence and asks her if she can wear another swim suit for him. Sonico is a professional and doesn’t hesitate, but this doesn’t mean she is not a bit embarrassed. Actually, the contract that Mr. Kitamura signed with the client was very specific, but since Kitamura is not around, the client wants to push Sonico to take more pictures. But right before they succeed, Sonico’s manager arrives and states that Sonico’s job is done as arranged. A bit later, Sonico returns to her grandmother’s bar and helps her attend the regular clients, a bunch of old guys who love playing baseball and have a beer or two after. As the day comes to an end, Sonico receives a phone call from Suzu Fujimi, the leader in the First Astronomical Velocity band. 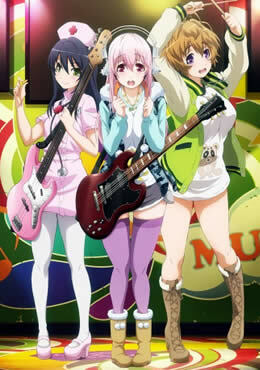 Once with the band, Sonico, Suzu and Fuuri Watanuki take their time to practice a new song. Is a fictional female character created for the Japanese computer and video game software company Nitroplus, first appearing as a mascot for a Nitroplus-sponsored music festival in 2006. Nitroplus has since developed the character into a media franchise that includes music products, manga series, computer and video games, toy figurines and other merchandise. An anime adaptation by White Fox based on the character began airing in January 6, 2014.